Some of you may have been waiting for another post about the ostrich eggs I have been painting. And justifiably so -- it has taken me quite a while to finally post about them. Well, here it is. I've painted two ostrich eggs since my last post. 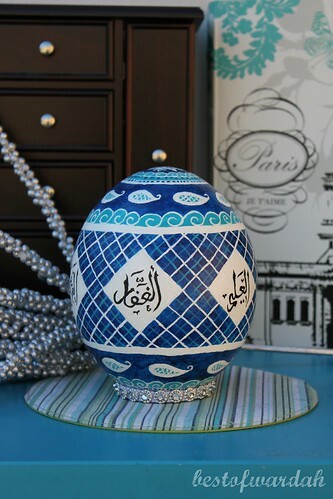 This first egg in particular was a commission from a very sweet lady, Apa Lubna. Her mother had an ostrich egg of her own but when her son was visiting, he broke the egg. Of course, her mother didn't hold a grudge against her little grandson. 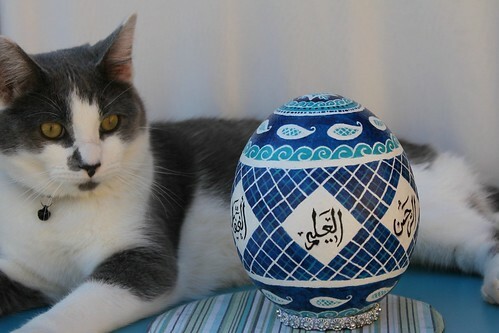 But still, Apa Lubna insisted on replacing the egg. Actually, I think this egg is a surprise. 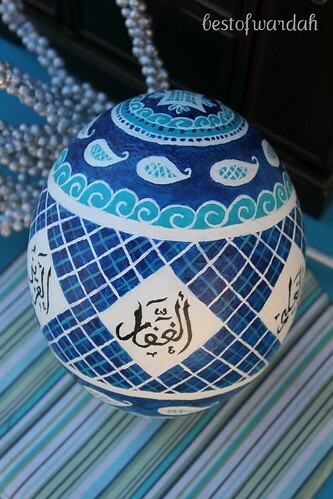 This egg was based on a pattern Apa Lubna saw on a website. 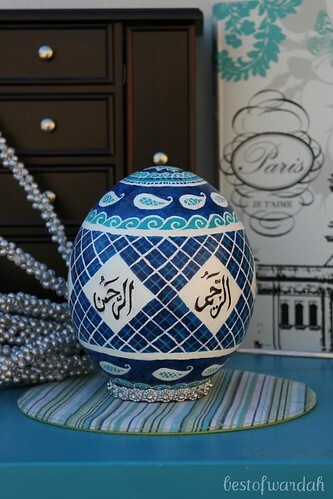 I incorporated the Arabic calligraphy and the paisley designs on the egg of my own accord. My favorite part of the egg is the view from the top because even though everything looks very rectangular from the sides, it's actually very circularly fashioned. I finally got him to pose properly. He would not stop looking in the wrong direction! Lesson learned = animals do not make good models. I hope you all enjoyed this post. Look forward to another ostrich egg coming up very soon. And don't forget, email me at warif93@gmail.com if you are interested in having a painted ostrich egg of your very own (while eggs last). how much does it cost if we want to get an ostrich egg painted? 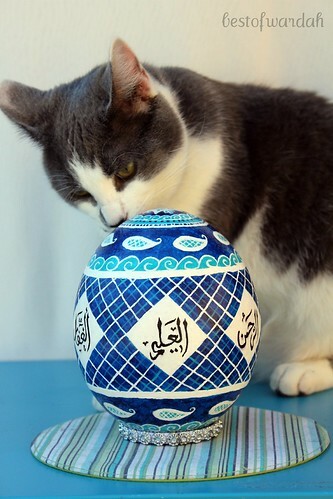 I'm your lovely cousin Hadia, I showed the egg to my daughter and she approves and actually would like to have one for free, so please send it to us asap. Jazaks for the great comments everyone! Hadia Baji, for you, anything is for free. I'm glad you and your daughter liked the egg! 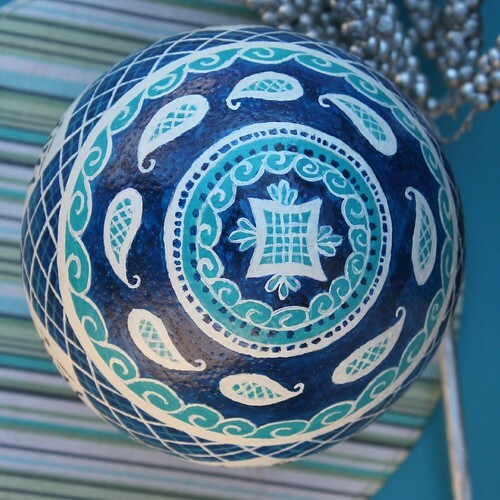 I'll paint you an egg on one condition -- if you come visit me. I miss you and I'm dying to meet your daughter!